School age kids love art! It allows them the opportunity to unwind after a hard day's work at school, and it's a very important outlet for their creativity! But how many parents consider cooking an art? Do you? Well, you should! Let's draw an analogy between painting and cooking. When cooking, you can either go by the recipe or you can experiment with different flavors, colors and textures. In painting, you can either paint by number or you can throw paint at your canvas, paint with your fingers, pile up paint to make fun textures, etc. Do you see cooking differently? All individuals learn in different ways-some use touch (including taste), some use their sense of vision and yet others listen. Cooking is especially great for those kinesthetic learners-cooking allows children to roll up their sleeves and play around with ingredients. It's also highly rewarding to share the feast that you've just cooked up. So now hopefully you understand the benefits and the fun of cooking with your kids. Need some ideas to get started? Well, one tip is to keep it simple. Don't attempt a to make a difficult soufflé-recipes that are too grandiose will confuse your child and are more likely to fail. Decide on a recipe that's easy to grasp and will give your child a sense of accomplishment! Also keep in mind that it should be a tasty and exciting dish-that could mean a colorful dish or something that's fun to eat, like burritos. Be sure your kids know some generally safety precautions before cooking. Also, be there to supervise the use of stoves, ovens, blenders or mixers and the handling of any warm liquids! 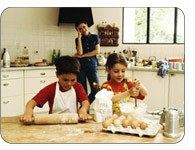 Here's some tips on safety precautions that you can mention to your child before the two of you begin 'kid's cooking'! Never put your fingers in your mouth after having touched raw meat. Crack eggs into a small bowl first, so that you can remove any little pieces of shell that fall in. Never walk with a knife in case it drops or you fall and hurt yourself. Always tie up long hair with a hair elastic, so it doesn't get in food. Be careful when walking with eggs, as they could drop and make a big mess. Don't reach over the stove, as it might be warm and hurt you! Always let an adult handle the stove. Don't take the bowl from under the mixer or the jar from on top of the blender until the motor has stopped. Otherwise, you could have a real mess on your hands and possibly hurt yourself! Don't cook or bake unless it's ok with Mom or Dad! Now that we've got safety precautions covered, it's time for some fun! Here are some fun ideas on recipes for kids! Pizzas are so easy to make, whether you used prepared crusts or make the pizza dough from scratch. They're also healthier than pizza you take out from fast food pizza joints, as you get to control the oil. - Any toppings you want : pepperoni, green peppers, mushrooms, sautéed onions, etc! Remember, you can always buy a ready made crust, as it might be easier for kids. But for those adventurous kids out there, try making the dough. It's fun to pound the dough and gives little hands and arms a good work out! Kids also love seeing the yeast turn foamy, and there's nothing like the smell of fresh made dough to make lasting memories! To make dough, put the yeast, water and sugar in a bowl. Whisk the mixture until the yeast is dissolved. Let stand in a warm place for 10-15 minutes until it's foamy on the surface. Stir in the olive oil. Put the flour and sugar in a large bowl. Make a small well in the center and pour in the yeast mixture. You can either use your hands (covered with flour) or a wooden spoon to mix this all together to form a dough. Then put it on a floured surface and knead-use your fists to work through the dough. Once it's nice and smooth and a bit elastic, put the dough into a large greased plastic bag and let it rise in a warm place for about an hour (or until it doubles in size). Then take it out, put it back on the floured surface and pound, kneading for about five minutes. Presto! It's ready! Once you have your dough ready, just form it into a flat disk, then lightly brush the top with a bit of olive oil. Empty the tomato paste onto the dough and coat evenly. Then sprinkle anything you like on top! Cheese, olives, chicken, pineapples(?!) or raisins. The fun part of this recipe is that kids get to control what goes on top, which makes this the perfect recipe for kids! Pop in the oven at 400 degrees Fahrenheit until the dough has baked-if you poke it with a fork, the fork should come out clean. The cheese should also have melted, but not have burned. Cut up, serve and enjoy! In Belgium, these breakfast treats are called 'klakkers'. Perfect for kid's recipes, as it's easy to make, nutritious and yummy! In a deep dish, combine the milk, egg, sugar and vanilla. Soak a piece of bread until it's evenly wet, about 10 seconds for each side. Then melt a bit of butter in the pan. Throw the soaked bread on the pan and heat until it starts to brown. Flip on other side and repeat. Then cut it up into fun strips and enjoy! You can either blend the apples in a blender and then add the other ingredients OR you can throw all the ingredients into a pot with half a cup of water and simmer until the apples are squishy. Either way, the flavor is great! Hope you and your child enjoy these kid recipes! We've certainly enjoyed trying them ourselves! Bon appetite!